The history of collecting is a topic of central importance to many academic disciplines, and shows no sign of abating in popularity. As such, scholars will welcome this collection of essays by internationally recognised experts that gathers together for the first time varied and stimulating perspectives on the nineteenth-century collector and art market for French eighteenth-century art, and ultimately the formation of collections that form part of such august institutions as the Louvre and the National Gallery in London. The book is the culmination of a successful conference organised jointly between the Wallace Collection and the Louvre, on the occasion of the acclaimed exhibition Masterpieces from the Louvre: The Collection of Louis La Caze. 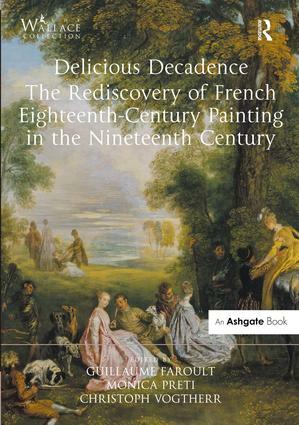 Exploring themes relating to collectors, critics, markets and museums from France, England and Germany, the volume will appeal to academics and students alike, and become essential reading on any course that deals with the history of collecting, the history of taste and the nineteenth-century craze for the perceived douceur de vivre of eighteenth-century France. It also provides valuable insight into the history of the art markets and the formation of museums. Contents: Introduction, Guillaume Faroult, Monica Preti and Christoph Martin Vogtherr; The ’rediscovery’ of 18th-century French painting before La Caze: introductory notes, Monica Preti; The taste for 18th-century painting and the art market between 1830 and 1860 as regards the La Caze collection, Marie-Martine Dubreuil; Watteau and Chardin, ’the two most truly painters of the entire French School’: the rediscovery of Watteau and Chardin in France, between 1820 and 1860, Guillaume Faroult; Collectors of 18th-century French art in London: 1800-1850, Jon Whiteley; ’Elegant depravity and irresponsible gaiety’: the Murray of Henderland Collection and the Scottish taste for French 18th-century art, Frances Fowle; ’Ah! que c’est franÃ§ais!’: Thoré-BÃ¼rger and 18th-century French art, Frances Suzman Jowell; Aesthetic, economic and political issues of the exhibition Paintings of the French School from Private Collections of 1860, Pauline Prévost-Marcilhacy; Early exhibitions of French 18th-century art in Berlin and the birth of Watteau research, Christoph Martin Vogtherr; The National Gallery in the 19th century and French 18th-century painting, Humphrey Wine; French 18th-century painting in England and the opening of the Wallace Collection, Stephen Duffy; Exhibitions listing; Bibliography; Index of names. Guillaume Faroult is Senior Curator at the Musée du Louvre in charge of French Paintings of the Eighteenth Century and British Paintings. He has curated many major exhibitions in these fields and in 2007 edited a catalogue raisonné of the paintings (mostly French of the Eighteenth Century) from the collection of Louis La Caze, now at the Louvre. He has published extensively about David, Fragonard and French eighteenth and nineteenth century collecting. Monica Preti is an art historian who received her PhD in History and Civilization at the European University Institute (Fiesole, Florence). She is a former Research fellow at the Institut national d’histoire de l’art (Paris), and since 2006 she is Head of Academic Programs (History of Art and Archeology) at the Louvre’s Auditorium. Her research focuses on the history of taste, collections and museums in the eighteenth and nineteenth centuries. Dr Christoph Martin Vogtherr has been Director of the Wallace Collection since 2011 and was previously Curator of Pictures pre-1800. Before joining the Collection he was Paintings Curator at the Foundation of Prussian Palaces and Gardens, Potsdam, Germany (1998-2007). In 2010 he published the catalogue raisonné of paintings by Watteau, Pater and Lancret in Berlin and Potsdam and, more recently, on Antoine Watteau, French eighteenth-century collecting and the Fête galante.